“The Great White Way” became one of the nicknames for Broadway (in New York city) in the late 1890s. The street was one of the first in the country to be fully illuminated by electric light. As the years passed and Broadway became more and more associated with theaters, their well-lit marquees added to the moniker. Probably every town in America envied NY, and aspired to a White Way of their own. 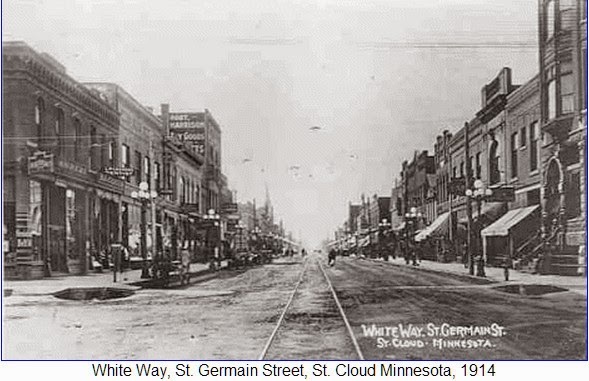 St Cloud made it in December 1912. December 20.--The White Way was opened last evening with a great celebration. The button was pressed at eight o'clock, followed instantly by a flood of light on St Germain street from the intersection with Fifth avenue to Ninth avenue and on Fifth avenue to Second street south. There are eight standards to each block, four on either side of the street, each standard having five lights. 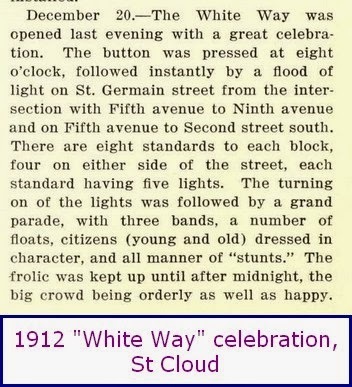 The turning on of the lights was followed by a grand parade, with three bands, a number of floats, citizens (young and old) dressed in character, and all manner of "stunts". The frolic was kept up until after midnight, the big crowd being orderly as well as happy.